Greetings my dearest and beloved friends! 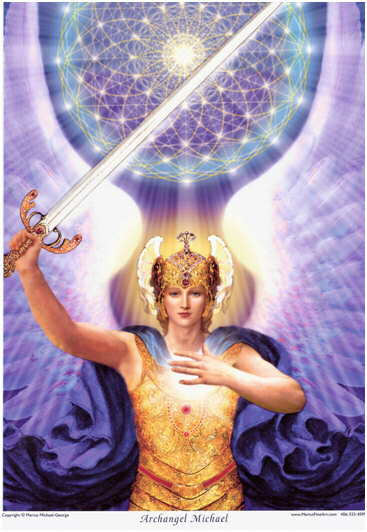 I am Mi-ka-el, Archangel of Love and Truth, bringer of the peace in your hearts and in the world, your brother, your ally and protector, always. I am here my wonderful friends, I am here to let you know that I am with you in every single way of the word. I am with you cheering and applauding your progress. I am here protecting thee from any harm. And when I say to you that I am guarding you it means that there is an absolute and complete shielding of you and of your dear family and all of your possessions. I am always by your side so nothing will ever interfere with your mission of light. Some of you find your dear self at a crossroad and you find yourself a little confused as to where and how you would want to proceed next. There is a new freedom that you found but there is also a new and unexpected type of challenge. There is this feeling that you are going backwards somehow but this is really very far from the truth. In fact, you are quite advanced in your expansion and there is this hesitation and some distress in finding your new center and balance. It is almost as if you have graduated precociously from grad school and then progressed and moved on to this new ivy league college. And yes, you are skipping high school because you can and because you are capable to do so in the Mother’s new time. And so, there is great excitement to find yourself empowered and advancing so fast, but at the same time you do not feel quite comfortable with the new responsibilities. It seems to take you forever to adjust to the new environment and to the New You. In a way, you keep on questioning your sweet selves and your competence to complete this new adventure. There is lack of trust in self and there is fear of failure. There is doubt in your ability to keep the course straight and whether you would be able to tend to every part of self and to your obligations and promises. Your new tasks seem to be completely different to what you have assumed them to be, and this is why we are encouraging you not to have any expectations especially in these times of chaotic and somehow turbulent changes. Dearest and bravest hearts, your work involves so much of the unseen type and takes place in many simultaneous realms and dimensions that you are not able to comprehend completely with the human senses and with your current brain capacity. There are remnants of debris that you bring back to thee in this conscious reality that makes little sense, and it can become quite disconcerting, but rest assured that these are only a few clues that you are indeed working overtime in cleansing and purifying this third and the lower fourth dimensional realities. Your guardians and higher selves, your closest guidance is making every attempt to fill you in and give you a picture of your advancement and a sense of moving forward along your path. On the conscious level though, there are times when it seems that your work involves past issues that you thought you had successfully resolved. Know that these are only your further attempts to clear more and more of the same baggage for the close family and for the collective rather than falling back into the old patterns. It might take you by surprise, it might get you a little discombobulated, but you always find your way back to clarity and balance. Remember that I am here with thee. 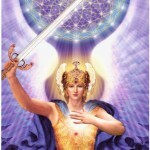 Remember to use the shield and the sword I have given you eons ago to cut through the illusions and veils. Never, ever, allow the thought or feeling that you are failing to enter your mind! Pull out the mirror that I have given you in love, gaze into it and see me smiling back at you. See me reflecting back and showing you how much you are glowing and shining. See the magnificence of who you are before you give any other thought to the idea that you might be failing or deviating from the course of light. Ask for assistance and for more clarity until you get familiarized with this new refined balance. Know that you have all the strength and wisdom to take your journey to the next level and to complete the tasks at hand in no time literally. You are exactly where you needed to be and in perfect timing. Proceed with confidence and joy! Trust yourselves, trust your knowing to guide you in every moment. You are loved and appreciated beyond measure! Until next time. Farewell.